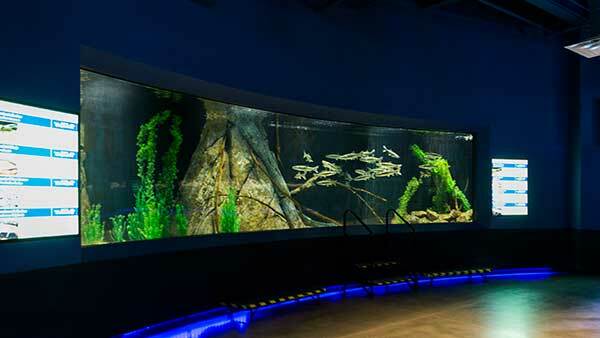 The Colorado River exhibit offers a glimpse into the life of some of Arizona's most important fish species. 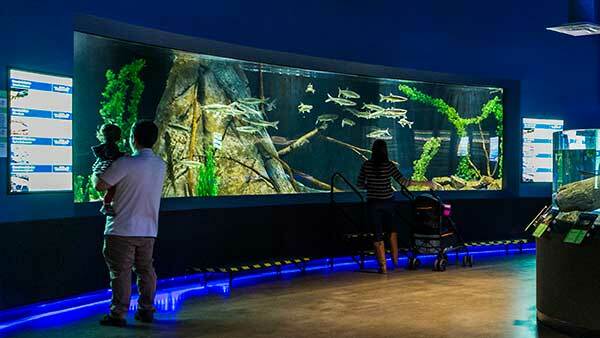 This exhibit also offers steps for smaller children to get a better view. The Colorado River has long been considered the lifeblood of the West. Its waters have been intertwined with the lives of humans living in Western North America for hundreds of years. What begins as a small mountain stream in the Colorado Rockies soon converges with the Green River from Wyoming to create the mighty Colorado. This magnificent river carved the Grand Canyon and has brought water, trade and power to humans for generations and continues to share meaningful information with us each day. 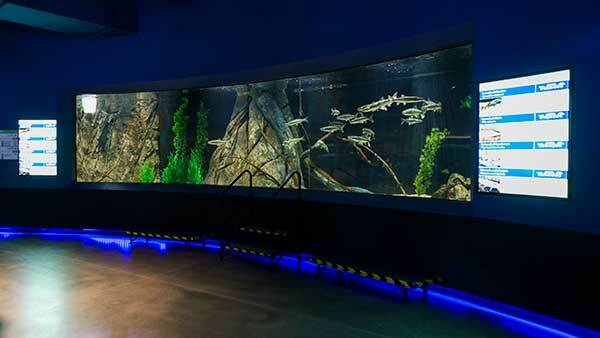 Below its churning waters lie one of the most diverse collections of endemic freshwater fish. There are 14 species of fish that live only in the Colorado River and nowhere else on Earth! The habitat of the Colorado river has remained relatively stable since many of these 14 species first evolved over 300 million years ago. However, with the industrial revolution humans have begun to alter the river habitat in more ways than we might have imagined. One of the main influencers has been damming, which not only changes how much water flows through a river, but it also changes the temperature of the water by holding back cooler bottom waters and releasing warmer surface waters. Species that once thrived in fast-flowing cool waters are now being subjected to slow, shallow warmer waters. In addition to water temperature, damming of rivers like the Colorado also changes the composition of the river bottom. Changes in flow alter the size and distribution of rocks and cobble, as well as aquatic vegetation, which affects many native species that require specific-sized gravel in order to spawn.